How Many Medals Are There To Win At The PyeongChang 2018 Games? 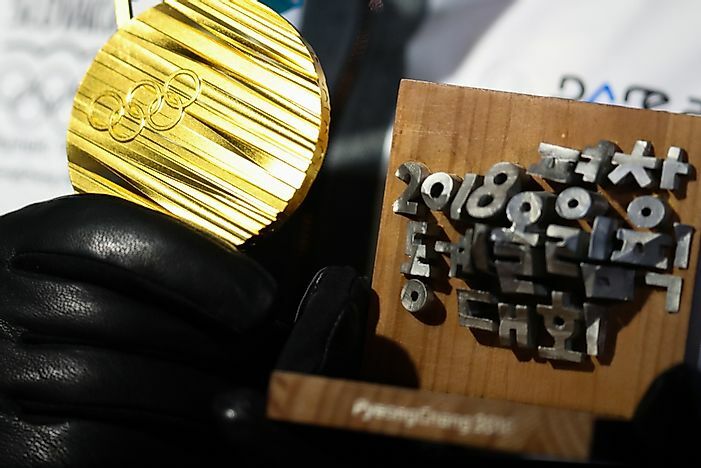 There are 102 gold medals to be won a the PyeongChang 2018 Winter Olympic Games. The PyeongChang 2018 games (23rd Olympic Winter Games) is an international winter multi-sport event to be held in, South Korea’s Pyeongchang County between 9 and 25 February 2018. This marks the third time East Asia is holding the winter games after Japan in 1972 and 1998. The Olympics comprise of fifteen sports featuring a total of 102 events.The Games' medal designs were inspired by Lee Suk-woo, and feature a pattern of diagonal lines on both sides. The front features the Olympic rings while the obverse features the winter games' emblem, event name, and discipline. The edges feature extrusions of Hangeul characters while the ribbons from are made using Gapsa, a traditional South Korean fabric that is also embroidered with Hangeul patterns. It is a long-track form of ice skating where competitors race each other by traveling a certain distance on skates. All speed skating events are being held at the Gangneung Oval in Gangneung city. It is the most awarded PyeongChang winter sport with a total of 14 gold medals. It is a form of sport where skiers depend on their own motion, rather than support from ski lifts, to navigate through a snow-covered terrain. The event is being held at 4 different ski hills Alpensia Cross-Country Centre and attracts a total of 12 gold medals from the twelve events under the category. Biathlon combines rifle shooting and cross-country skiing and is mainly based on the shortest possible time to win. Missed shots mean additional time or distance to the competitors. The eleven event sport attracts a total of 11 gold medals for the different categories. It involves sliding down a snow-covered hill on skis with fixed-heel bindings that are more technical than cross-country skiing. It was incorporated in Winter Olympics in 1936. Alpine skiing will be held at Jeongseon and PyeongChang. Due to the additional team event, there will be a total of 11 gold medals to be awarded. It is a winter sport involving springing down snow-covered slopes using snowboards clipped to the springer’s feet. The sport began as a recreation sport in the US and was incorporated in the winter games in 1998. There are 10 gold medals to be awarded under this category. Freestyle skiing involves a number of events such as moguls, cross, half-pipe, and slopestyle performed through aerial flips and spins. A total of ten freestyle skiing events will be held with a total of 10 gold medals to be awarded. The total number of gold medals to be awarded during the event are 102 for the fifteen competing categories. Each of the gold medals weighs 586 grams bringing it to a total of 132 pounds the total standard weight of five gold bars.